I wasn’t supposed to be racing this weekend, April and May were really busy and I was enjoying having a few weeks off. There were a number of events that I wanted to do but with 3 races in the next 3 weeks I thought a weekend at home chilling would be good. As the week passed and the trails got dustier I was itching to get out on my bike with friends over the weekend. 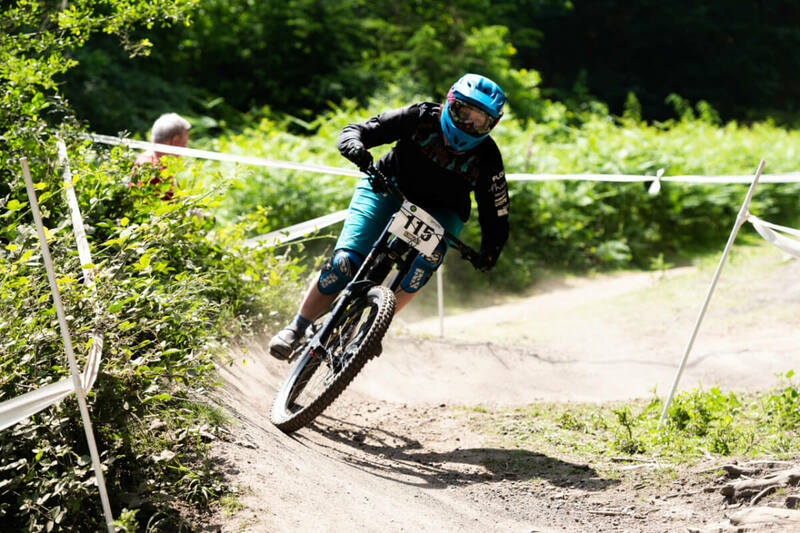 I realised if I raced a nice fun local race at Forest of Dean I could see my friends, ride loads and still get Saturday to do other things so I found myself entering and filling my quiet weekend with busyness! The fun started on Friday afternoon; I pulled on my new socks and met Amanda for a sweaty fun ride. I hadn’t ridden the track before and it soon became apparent that whilst there was nothing hard on it, the faster you went the trickier it became! I buried my face in a nice pile of loam that turned out not to be the berm I expected and it carried on from there. Amanda glided serenely down the track while I hammered down it with all the grace of a rhino, tyres chattering up the corners and loam spraying everywhere! Amanda took the smooth outside lines and I ragged it through the inside lines, 2 totally different riding styles but there wasn’t much in it in terms of overall speed. I wasn’t riding smoothly but I was having a whale of a time! Then I blew my shock, oops! I had planned to race on my enduro but that was obviously not meant to be so we cut our fun short and I went home to wash the dust out of my eyelashes! Saturday was awesome, it dawned hot and blue, well I don’t know if it dawned that way since I spent most the morning snoozing but by the time I dragged myself out of bed it was lovely morning haha! I had a lazy breakfast then went off on my favourite walk with Charlie. There was a gooey brownie in a café, lots of bogs, streams and ponds and pretty colourful butterflies everywhere. The only downside was the horseflies. This year seems worse than ever and saw me sprinting up a hill in blazing sunshine trying to outrun a swarm of them that I couldn’t kill fast enough (once they’ve found you they don’t go away until you’ve swatted them, outrun them or they’re full of your blood!)! I spent the rest of my walk swatting myself and the air around me with a trusty branch of hazel. I’m pretty sure I looked a little weird but I met a few others doing the same and we exchanged stories of running away from swarms of the nasty little biters! We were all weird it turned out. I spent an enjoyable evening do bike maintenance. I removed the shock from Edith as the fabulous Sprung were going to fix it for me in time for next weekend and replaced my rear mech hanger on the Sender. I knew it was a little bent from Fort William but it was nicely bananared! A BBQ with friends to end a beautiful day and it was off to bed for an early start. I took the dogs for a walk at 6am on Sunday and it was already shaping up to be a scorching day. I packed all my water bottles and set off for the Forest of Dean to catch up with mates and get some line practise in before the race. I slid through the loam on my face a few more times and decided I couldn’t push my bike up the hill in the heat any more so the lines I had would have to do! In between practise and race runs there was a memorial ride to remember a young lad from South Wales who had been a frequent racer at FOD and had sadly lost his life earlier in the week in a riding accident. The Welsh crew were in fine voice as a train of over 100 riders rattled down the race track. Sitting in the café before run 1 with a bunch of ladies enjoying tea and cake I realised I wasn’t nervous at all. For lots of the ladies this was their first or second race and they were struggling with fear and nerves as I would normally be. With all the other big races on my calendar this year, some of which have seen me literally shaking at the start gate, it was a pleasant change to be racing on a nice track with loads of friends. We all pushed to the start and sat mopping sweat off our brows, I know ladies are supposed to glow not sweat but the only glow was our bright red faces as we hid in the shade and tried to cool off! The start beeps had a lovely computerised voice that spoke to you with only the last 5 seconds as beeps. This was a lot more pleasant than the normal fear inducing beeps and I set off in to run one with a fabulous clip in fail! I then proceeded to slide out in the first real corner before getting it together and smashing through the bottom of the course into 3rd place. It was super tight between me, Helen and Amanda and the next run was set to be a battle of friends with each of us vying to take that top spot! There wasn’t much time between race runs and soon enough we were sweating out way to the top of the hill for run 2. The heat had dried any last bit of moisture out of the track and huge bowls of dust had developed where there were previously corners and the grip had vanished further. I set off into run 2, made it round that first corner and had a smooth run through the dust. The course was blown out with roots appearing through the dust but it rode well and I crossed the finish line to retain 3rd place behind Amanda in 2nd and Helen in 1st. Weirdly despite a smoother run I went slower, as did most of the ladies, maybe I should have continued to ride like a rhino haha! We celebrated with Amanda’s trade mark champagne at the bottom of the track. It was my first podium for quite some time and sharing it with friends made it all the better. It’s taken me a long time to build my speed back up; sitting on the side-lines last year and coming back this year miles behind everyone else has been tough. I’m finally getting my mojo back and all the training is paying off as my speed creeps back up race by race. A chilled weekend sliding through the dust laughing with friends was exactly what I needed and I can hardly wait for the next 3 weekends of fun. Thanks to all my sponsors for helping me get back on that podium but in particular The Physio Clinic Bristol for their support with training and building back my strength.